Finally got around to modifying my Soviet era ABM-1M (AVM-1M in english) Submariner (Podvodnik or in Russian подводник) regulator. Contrary to what most people think, it is a two stage regulator, not a single stage. This is made clear on page 38 of the Soviet Manual of Scuba Diving. It operates as a down stream system with the Russians calling the first stage a "lever reducer" and the second stage being referred to as " valve of automatic device". The reg does have a hefty overpressure relief valve to stop damage to " reducer" and should release at 165 BAR (2393.12 PSI). The reg is rated for a max "pressure forward of the reducer" ie; tank pressure, of 150 BAR or 2175.57 PSI, so sorry, no tanks greater than 2250psi and no PLUS (+) do-dads for this baby, or you'll pop it like a cork, meaning your HP diaphragm will blow out! Gee how do I know about this little nugget of knowledge.....Hmmmm? How to adjust it you say? Fill a tank and let it cool and ensure that it has approximately 165 BAR in it and adjust your overpressure valve until it stops hissing, then tighten down another 1/8th of a turn. Check with a tank of 170 BAR and the valve should leak, then subside. Works for me, you know, tweak the leak. No wonder I see so many pictures of this gizmo with dual tanks. The Russians appear to be using the equivalent of our 36cuf, LP dual tanks in most pictures of the AVM (ABM) in use. Since I have machinists available that do excellent turning work over here, I had an old yoke assembly modified to thread metrically to my AVM. I dive it in the pool tomorrow. Just to make sure no one mistakenly buys the wrong Soviet regulator, I want to point out that the Soviet/Russian two hose regulators you see currently on eBay are NOT 2 stage regs, and they are not AVM-1Ms. And they are not single stage regs, either! They are the AVM-3, which is a SECOND STAGE, not single stage, reg that requires the use of a remote first stage. DO NOT connect the AVM-3 to a tank w/o a first stage in between! They are recognizable by the 2 port LP connection pipe that sticks down prominently. The two regs share the same or very similar bottom can, cloth covered hoses, and metal mouthpieces. Their similarity looks-wise might be the reason people are confused and think the AVM-1M is a single stage regulator. The Sportsways doublehose non-return valve cages EDIT: ( are just slightly larger than the openings on your metal mp. INCORRECT! I forgot what I had to do to fit them. They actually fit inside w/o shaving, but need a small cutout on one edge to fit around the MP tube.) If you can get ahold of some they are easy to modify and get inside! A perfect seal could be accomplished with an o-ring groove or two. Some of the components such as the actuator diaphragm, duck-bill, exhaust can and can rings can be used by both ABM-1 and ABM-3. The AVM-3 was used in the SHAP-62 set up almost exclusively. The 1st stage is nestled down into the three tank maze of the SHAP-62. There's a complete set on eBay for $300 frogskins plus $200 shipping from Ukraine. In the picture below in the lower left, you can see the 1st stage. By the way, what looks like a "B" in Russian is actually pronounced as "V", so you will see me jump back and forth between the two. Great idea, by the way, about using those "Sportsways" wagon wheels in the Russky mouthpiece. What I will probably do, however, is use my Russian DSV that has its own check valves. That is the one I used on my "What If' Scubapro had made a Double Hose Regulator" spoof on Youtube. Then again, I just might keep in ala CG45. I'm working on a yoke adapter for the AVM-1M. 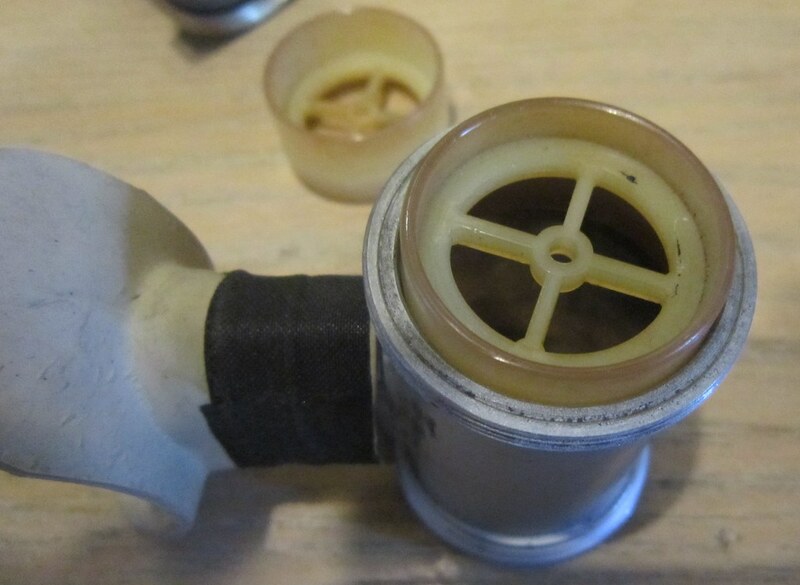 It will replace the silver fitting (filter holder) that screws into the body. It should reduce the length of the assembly by 1/2 - 3/4 inch or so, so the reg isn't pushed so hard outward. It will still be a bit long, but I should be able to get it minimized. I need to get some 1 1/4" brass stock tomorrow, so I can start making chips! The adapter will utilize a USD yoke. Man Russian gear looks so much more convoluted than western gear. Weird, because in the firearms world it's the exact opposite. Document more if you get time.. There's a lack of info on the USSR dive gear. Just got a copy of the Soviet Diving manual that was translated back in the 80s to English. It is fairly comprehensive and includes descriptions of not only the USSR stuff but the Russky view and use of Warsaw Pact and western equipment. The translation is very direct, so sometimes you have to just take a SWAG as to what he is referring to. If anyone needs certain specs on a given Soviet reg. I now have them so just chime in if you need it, and I'll send you what I have or post it here.